Do Streaming Movies Decrease Demand for DVD's? More and more movies are available instantly through streaming services like Amazon Instant and Netflix Instant Queue. A customer has the option to stream it directly into their home and isn't forced to buy a DVD in order to watch the movie. Does the electronic availability of these movies change the price of the DVD? 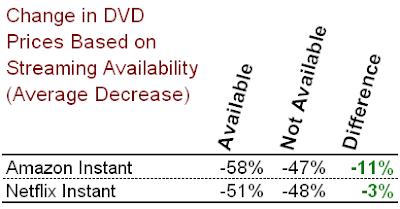 The average price for a DVD in our study dropped 58% if it was available on Amazon Instant, but only 47% if it was not available for streaming through Amazon. A difference of 11 percentage points, which is statistically significant (see methodology below). The average price for DVD's available on Netflix dropped 51% compared to a drop of 48% for those not available instantly. A difference of 3 percentage points, but is within the margin of error. Why does Amazon's instant movie service decrease demand for DVD's while Netflix's service does not? This can be attributed to the types of customers using both sites. Amazon sells DVD's and offers customers the chance to stream the movie on the same page they offer to sell the DVD. If streaming is not available a large portion of them would buy the DVD. But when streaming is available it cannibalizes some of those customers. Netflix on the other hand does not sell new DVD's and their users are more accustomed to renting DVD's. If the movie isn't available via streaming they will probably choose to add the DVD to their mail queue instead of buying it. So there is very little if any change in demand for DVD's caused by Netflix's service. Methodology: For this study we randomly selected 112 DVD's released during 2010 from the Comedy, Action, Adventure, Sci-Fi, Drama, Horror, Animation, or Family genres and calculated the drop in price from the original MSRP to the current New price. We then looked to see which of these 112 movies was available on Amazon Instant Video and/or Netflix Instant as of May 16th 2012. The average price change was calculated for those movies available for streaming and those not available and a statistical test to see if the difference between the two averages was meaningful (statistically significant). The test of two means was significant with a 99% confidence between the Amazon available and unavailable movies, but was not significant for the two Netflix averages even at a confidence of 90%. I'm likely to rent a movie from amazon if its not available on netflix, and sometimes if for some reason the title goes up for sale but not rental on the release date I usually end up buying a digital copy off amazon.